Having tried a few incarnations of Baked Eggs over the years, I’ve settled on this method as my favourite (for now at least..). I like to use the enamel coated metal dishes rather than ceramic pots so it’s not HOTTER THAN THE SUN for a good twenty minutes after serving. Fry the leeks, mushrooms and garlic in a little oil (feel free to add in a knob of butter too). Cover the base of 2 dishes with a thin layer of crème fraîche and top with the leek and mushroom mix. Grate or sprinkle over a tiny amount of nutmeg and season with salt and pepper. Top with a layer of grated cheese – Gruyère brings a lovely flavour to the dish but a good Cheddar works equally well. Cover the cheese with a layer of baby spinach leaves and crack two eggs into each dish. 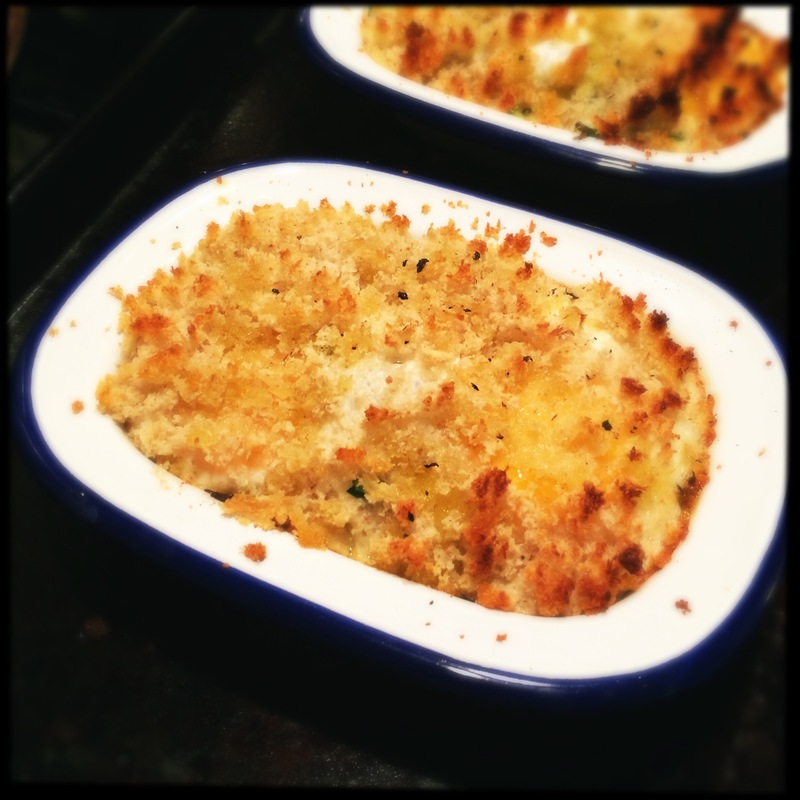 Dot the eggs with crème fraîche, season again and then cover with a layer of breadcrumbs. I like to use slightly stale Sourdough and blitz it in the food processor. Don’t forget that you can always make batches of breadcrumbs from leftover bread and then freeze it in bags – it will defrost in no time. Drizzle with olive oil and bake for 10 minutes – the top will be golden and crispy while the egg yolks will be beautifully runny. You know what to do if you’d prefer them hard. This is an entire meal in one dish and make a fabulous lunch.